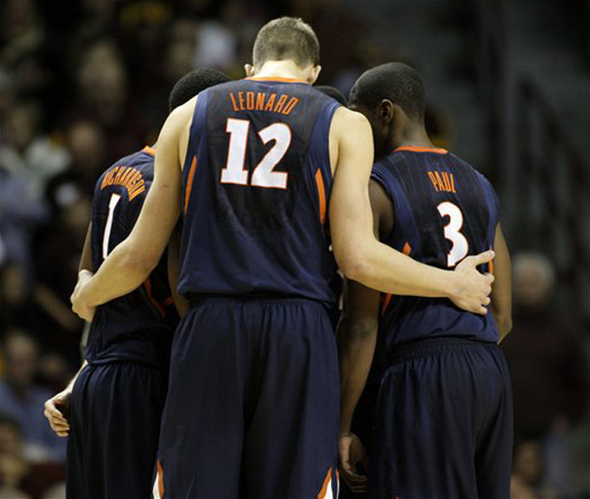 Posted on Fri, Feb 10, 2012 : 4:13 p.m.
Illinois center Meyers Leonard is 7-foot-1 and averages 13.5 points, 7.8 rebounds and a league-best 2.1 blocked shots per game. Michigan basketball coach John Beilein has been up front about his team's size this season. Size issues or not, though, another tall task awaits the 22nd-ranked Wolverines this weekend when Illinois and 7-foot-1 center Meyers Leonard visit Crisler Center (1 p.m., CBS). "He's really tough to stop one on one and we've got to find a way to do that," Michigan coach John Beilein said. "He presents a similar challenge to (Indiana) freshman Cody Zeller in that he can score, he's got a jump hook. 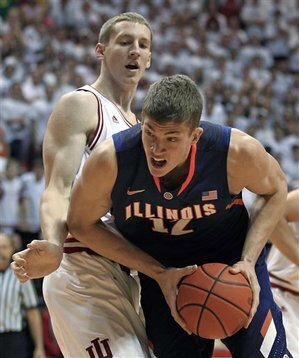 Illinois sophomore Meyers Leonard averages 13.6 points and 7.3 rebounds in Big Ten games. Leonard, who weighs 245 pounds, has been one of the Big Ten's most improved players this season, entering Sunday averaging 13.5 points, 7.8 rebounds and a league-best 2.1 blocked shots per game. A year ago, Leonard was used primarily as a backup to then senior Mike Tisdale, a 7-foot-1, 250-pound player. However, Leonard's sophomore season has been much more prolific than Tisdale had in four years at Illinois. So much so that some NBA Draft analysts peg Leonard as a lottery pick in next year's draft. NBADraft.net slots Leonard as the 11th-overall pick next season, three spots behind Ohio State's Jared Sullinger. But Michigan's not worried about Leonard's pro ceiling, it's just worried about finding a way to minimize the damage Sunday. "He's a really good player," Michigan senior Zack Novak said. "He's really improved from last year, and I think his athleticism is what sets him apart. "He's one of those guys that they can just throw it up to him, and he can go get it." Michigan has had its rough patches this season against teams with major bulk in the middle. Ohio State pounded the ball inside and dominated the offensive glass in a 64-49 victory against the Wolverines last month in Columbus. And Michigan State out-rebounded Michigan 40-16 in a 10-point win last weekend. The main draw against Leonard this weekend likely will be sophomore forward Jordan Morgan, with junior Blake McLimans and sophomore Evan Smotrycz also taking turns at him. Beilein also hinted that Michigan may send double teams at the Illini big man or try other defensive wrinkles. One way or another, though, the vertically challenged Wolverines will again have their hands full. "He's a true 7-foot-1," Beilein said. "And it'll be a difficult matchup for us to deal with. We'll have to stay out of foul trouble and just try to guard him." Beilein said he was encouraged by the strong shooting performance of reserve junior Matt Vogrich on Wednesday at Nebraska. Vogrich went 3-for-3 from behind the 3-point line in the second half, finishing with nine points. He's shooting just 27 percent from deep on the season. Even so, Beilein is hoping the 6-foot-4 guard can add a punch from the bench that's been missing for most of the season. "We've been doing everything we can with him to see positive outcomes," Beilein said. "You're golfing and you can't make a putt, so you practice and practice, but you've got to make one to feel good again. "He's gotten through that now and, hopefully, it'll help. Same thing with Evan and Blake, but again, it's very, very difficult to come off the bench." With injuries to Jon Horford and Eso Akunne, and asthma flare-ups hindering Carlton Brundidge (who has yet to receive practice clearance), Vogrich, Smotrycz and McLimans have become the three consistent bench players in Beilein's rotation. And though he'd like to see more production from those three, Beilein does say that a limited bench isn't the end of the world. "It's that time of year that people shorten their bench a little bit," Beilein said. "You're talking to one of the few coaches left that coached before the shot clock, before the (3-point) arc and before media timeouts. ... Back in (those days) you (needed more of a bench). "Although, (legendary Division II coach) Herbie Magee has won 900 games and check the minutes (on his) box scores sometime. It's 40, 40, 40, 38, 4, 4. And he's won 900 games, so it's not the end of the world if a guy has to play a lot of minutes." Following the Nebraska game Wednesday, Novak had to be informed that he'd broken the 1,000-point barrier for his career with a 3-pointer in the first half. His fans, though, didn't need the same help. "I guess I didn't think it was that big of a deal, but I guess everyone's reaction afterward of being shocked it had happen maybe made it a bigger deal (than I thought)," he said. "But for me, I'm just more happy with where the program's come with that time. "We're winning, there's people in the stands and that's so much better than any (career point total)." The tipoff time and date for Michigan's final home game of the 2011-12 season has been finalized. The Wolverines will host Purdue at 6 p.m. on Saturday, Feb. 25, for their final contest at Crisler Center this season. The game will be aired on Big Ten Network. The Wolverines will honor Novak, Stu Douglass and Corey Person during a senior night ceremony prior to tipoff. Fri, Feb 10, 2012 : 10:37 p.m. I assume you mean Saturday, Feb. 25. Sat, Feb 11, 2012 : 12:49 a.m.
You're right, Jim. Fixed, thanks.